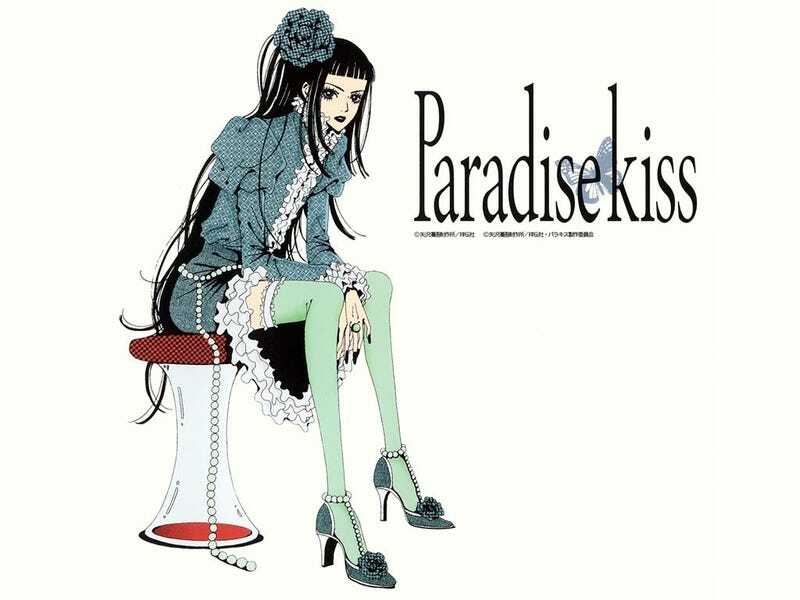 Paradise Kiss, an anime I've yet to watch (thanks to Jeremy Clarkson and an unaired episode of Top Gear) yet it features a song I really enjoy. Anyway this is just a song I can understand, sing along without sounding crazy and pronounce the lyrics more naturally! It's an amazingly catchy song and an exceptional all-rounder really in terms of your instrument composition which compliments the vocals well. Let's first start with the visuals; we've changed art style on our characters to something a lot more accessible, simplistic yet retaining key details we need to distinguish characters. This is somewhat akin to chibis. Fair play, that means we can already interpret this as something abstract, or non-related to the actual plot since it hasn't adopted the artistic form from the anime. Then we get this really interesting contrast with art style with the magazine covers which seem to have our characters featured on the front cover. My understanding is that it might be each characters idea of beauty (or fashion), each personified by the type of magazine they're featuring in. TIME, Elle etc etc. What's interesting is we find all four main characters in front of another highly detailed realistic portrayal of Marilyn Monroe. Why is it that suddenly a car has to come crashing through the head of hers? Maybe it's reality, something that drives the divide between a fantasy and reality. Notice how we find two of our characters earlier running away from cars in the sequence and here it shows up again. Are they running from something? Is something catching up to them? Anyway, let's discuss some clever directing in the shape of negative space. The chance we're watching something widescreen is really high. Yet here we have very thin tall objects on screen. We can't possibly stretch the image of the object (a magazine) because it would ruin it, so instead we'll keep the original and have black bars on screen. What does Hiroyuki do? He puts the main thing in focus by placing it in the centre, leaving a lot of negative space on both sides of our screen, which he then fills with the credits! Ingenious isn't it? Simple yet effective in fulfilling the role of an ending credit sequence. He does it with the magazine front covers and with the characters dancing in a coloured background. Fruity Drinks use to be in a band. Though he got quickly booted out when people found out he wasn't a cute high school Japanese girl.